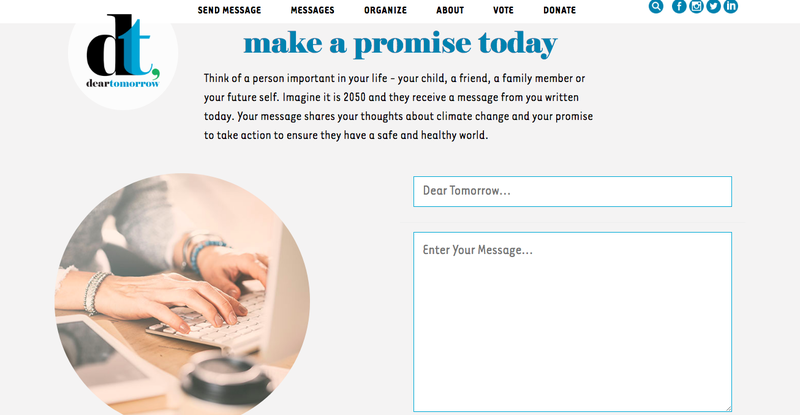 DearTomorrow is a digital community where people publicly share letters, photos and videos addressed to their kids, family or future self about how they think about climate change, why its important and what new personal actions they will address climate change. All messages are shared on deartomorrow.org and selected messages are amplified through social platforms, traditional media, videos and public arts projects. Our platform, deartomorrow.org, is an innovative, research-based public engagement and communications project where individuals share personal, hopeful messages about environmental and climate action to inspire new thinking and concrete actions. DearTomorrow provides a framework for deeper values-based engagement and accessibletools for empowering individuals, organizations and communities to tell their own stories. There is a need to rapidly decarbonize the global economy. Solutions are available, but the uptake of political & behavioral solutions is too slow when compared to the scale & urgency of the crisis. Despite increased levels of public awareness, climate change remains a low priority. Americans concern with climate change is remarkably low, in Gallup’s 2016 survey asking people to identify the most important problem facing the country, only 1% of the population named any environmental issue (Egan & Mullin, 2017). Climate change is often characterized as overwhelming, distant or highly politicized. Furthermore, there is a pervasive culture of climate silence, where people do not discuss climate change in their everyday lives. In the U.S. only 19% hear about global warming at least once a month from people they know (Leiserowitz et al 2017). Similar data on public engagement and prioritization has been shown in the UK, Australia and other industrialized countries (Corner & Clarke, 2017). DearTomorrow provides a personal, hopeful, action-oriented framing for people to think more deeply about climate change, make public commitments and then share those stories with the people around them. Using Global Warming’s Six America’s (Leiserowitz, 2016) to understand our targeted audiences, our focus is to empower the alarmed (18%) and concerned (34%) to deepen and verbalize their engagement in climate change action. We work to fill the gap between those who are either alarmed or concerned (collectively 52%) and the people who are actively talking about climate change. In addition, we can reach those in the middle, the cautious (23%) and disengaged (5%). DearTomorrow is open for everyone; however, we target parents with young children. In the U.S. there are 16.2 million Millennial moms (PEW, 2017) and 32 million Millennial parents (Barkley). 71% of Millennial moms and dads are influenced by parenting websites, online forums, blogs and their social networks (Barkley). One of the main barriers to climate action has been the psychological disconnect between today’s choices and tomorrow’s consequences. We bring the future closer to the present by asking participants to reflect about their own climate legacy. In addition, we are working to overcome the societal problem of climate silence by encouraging people to create and share new narratives about climate action. Through our process, participants make new personal commitments to take action and to share them with their own personal networks. While we do not prescribe any specific actions that people must take, our new site (released August 2018) highlights 12 of the most effective actions ranging from personal actions in the home (i.e. renewable energy, food) to community and political actions (i.e. voting, talking about climate, carbon pricing). We draw upon research around the power of legacy, narratives, visual imagery and trusted messengers (close friends and family, leaders within various communities) who use their own voices and messages to reach their own communities and networks. A strong body of research supports this model (Shrum 2016; Zaval et al 2015; Pahl and Bauer 2013; Arnocky 2014; Doherty & Webler 2016). We use the power of legacy by asking participants to write a climate message to a young person they love, imagining that person opening up a message from them in the year 2050. When people think about climate change in the context of someone they love, it shifts their thinking from an issue that is distant to one that feels more personally relevant and immediate. We then ask people to share these deep personal narratives and images with their friends, family and social networks. We publish our favorite messages with the aim of creating a diverse set of climate stories to demonstrate people’s depth of commitment to climate action. 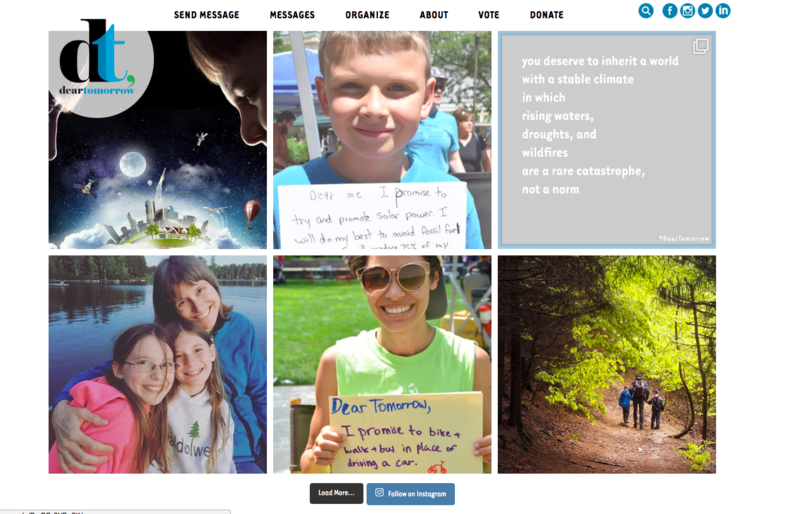 DearTomorrow (deartomorrow.org) is a digital platform and archive where people publicly share messages dedicated to their children, family or future self about climate action. Messages are published on deartomorrow.org. We curate the best stories about climate action through traditional media, social media (Facebook, Medium, Instagram and Twitter), community events, exhibits and arts projects. The aim is to make climate change more personally relevant and to break throughthe barriers of climate silence by creating, sharing and amplifying personal, hopeful, action-oriented messages about climate action. We faced a number of barriers in the early stages of the project, including: initially recruiting participants, reaching new audiences, and measuring impact. To ensure participation and reach new audiences, we’ve recruited a diverse set of partner organizations to carry out the project within their own communities. We are also constantly working to improve the user experience and social strategy. Based on feedback from participants, organizers, volunteers and staff, we are relaunching the website (version 3), the online toolkit (version 2) and a new social strategy. 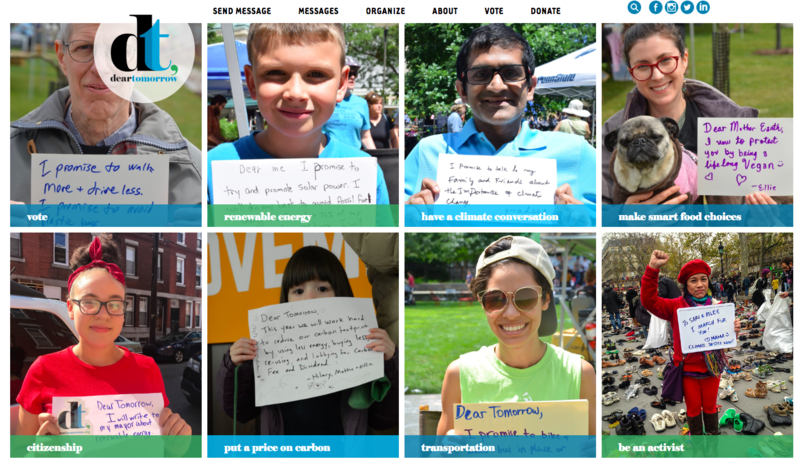 We now have more than 1000 deep, personal stories of climate action. This success is due, in part, to the lack of outlets for people to express their ideas about climate change in a way that is commensurate with the complexity and urgency of the problem. In addition, we’ve been able to establish real partnerships because organizations are beginning to recognize the importance of narrative storytelling and behavior science, but they lack internal capacity to do this work. Finally, we have been able to build a strong, talented team of experts, advisors and volunteers who currently are assisting us with our legal, communications, digital marketing and outreach strategies. DearTomorrow is a distributed partnership model where we act as the lens for reflection and the central hub for collection and distribution of stories. Individuals, organizations and networks carry out the project within their own communities. This model has allowed us to form deep partnerships with leaders and organizations working across different communities, including: climate-parents groups, students, traditional NGOs, faith-based communities and business leaders. Partners have included: Moms Clean Air Force, Virgin.com, the Solutions Project, the Evangelical Environmental Network, Creatives4Climate, Reverb concert tours, and Before the Flood. In 2018 DearTomorrow launched a nonpartisan voter registration site with Jefferson’s List. We’ve also seen the organic growth of DearTomorrow through the organization of DearTomorrow events in 12 U.S. states, Washington DC, the UK, and Taiwan. The DearTomorrow model is being used to help launch new projects and organizations, including: Climate Dads, GreenFaith’s global Living the Change campaign and Our Kids’ Climate global campaign for 2019-2020. We receive pro-bono professional services from Climate Nexus, Artisan Council (a digital and marketing company), and Stinson Leonard Street LLP. Finally, as the project evolves, DearTomorrow is also becoming an open-source of narratives where artists, communities and organizations use DearTomorrow as part of their own work. Using a randomized control experiment that tested the DearTomorrow letter-writing concept with nearly 1800 participants, Shrum found that writing about climate change increases the actual willingness to pay for climate change mitigation (Shrum 2016). These results replicate a similar study by Zaval et al. 2016. Using text analysis of the experimental data, Shrum has recently drawn new important findings from the study-- the DearTomorrow letter treatment actually changes the way participants value future benefits-- it reduces their discount rate in a money-earlier vs. money-later task. In addition, over 80% of DearTomorrow letter writers who responded to a recent survey said that they had shared their letter with friends and family. Of those, nearly 60% shared their letter face-to-face and another 57% shared their letters on social media. Both are important for opening up the space for conversations and showcasing public commitments on climate. The inability of decision makers to focus on long-term benefits of climate change mitigation instead of short-term impacts is one of the most universal and often insurmountable barriers to action. The evidence that the simple act of writing a DearTomorrow letter can make individual preferences more future-oriented indicates that DearTomorrow has the potential to be game-changing for climate action at the grassroots and policy level. There is additional research underway by Shrum and Markowitz to measure--using a before-and-after randomized control experiment-- how people change their personal behavior and lower their carbon footprint after writing a DearTomorrow letter. Additionally, in a recent survey of DearTomorrow letter writers, 75% of respondents said they made changes in their life to reduce their climate impact after they wrote the DearTomorrow letter. Some felt that they were already doing everything they could, but that writing the letter helped them follow through. Our theory of change is that writing one’s personal narrative about one’s own place in the fight against climate change opens the door for them to stand up and make climate change a part of the cultural conversation. A comment from the user survey reflects this theory: “I think, for me, it was the personal reflection & connection to the past and present and specifically answering “what do I stand for?” Then synthesizing what will I do? that engaged us in further taking action. My mindset became both articulated and clear.” When one feels secure in his/her position, then he/she can step up and lead. This is a crucial part of the deeply impactful way in which DearTomorrow serves as a catalyst for action in communities across the world. People reported that after being inspired and empowered by writing a DearTomorrow letter, they gave speeches in their schools, ramped up donations and commitments, called their representatives and even went on to found a new business or non-profit. To date, we have relied heavily on traditional funding mechanisms such as foundation grants and individual donations. Approximately 60% of our funding is from the KR Foundation and 40% of our funding is from individual donations ranging from $10 to $25,000. While we continue to raise money from foundations and individuals, we are currently working to expand our strategies to include: peer-to-peer fundraising, events, a new monthly donors program, and by developing a freemium model. Under this model, all organizations can access to the website and toolkit, but larger, well-funded partners will pay for additional services (public speaking, leadership training and curriculum development) through co-writing grants or franchise fees. We have raised over $231,800 and have spent $193,100 since June 2015. This covered our director for 18 months and one consultant for 8 months allowing us to develop and upgrade our website (now version 3) and toolkit (version 2), conduct concept research, build our social and branding strategy, develop exhibits and local events and build a team of volunteers. 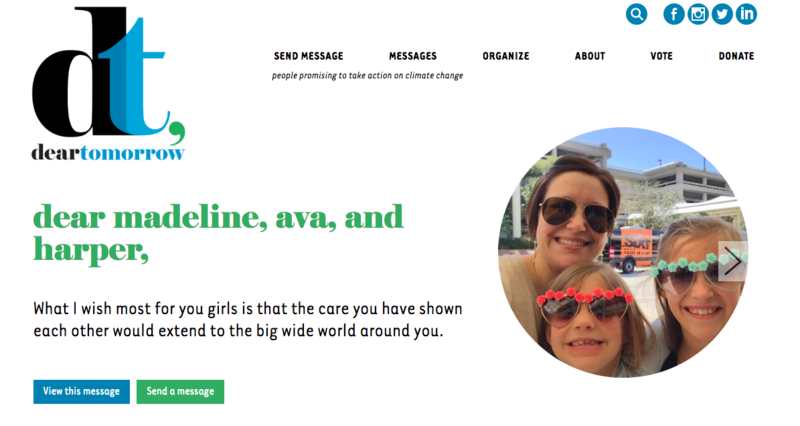 We have published 1011 messages about climate action, and have reached millions of people through social media, television, radio, and digital/print media. Because our digital project is now fully developed and our model set to grow both organically and through partnerships, the cost per engagement will continue to come down as we grow and reach more people. DearTomorrow is unique in that any person, organization or network can adopt DearTomorrow as part of their engagement strategy. Our digital presence also gives us the potential for exponential organic growth. DearTomorrow events have already been independently carried out by people in 12 U.S. states, Washington D.C., the UK and Taiwan. We have also had submissions from more than 50 countries. To fully scale, we estimate the need for 4-5 FTE staff members covering the following areas: director, partnerships and campaigns lead, research and impact lead, volunteer and training lead and a digital and marketing lead. In addition, we would like to hire a part-time fundraising and creative consultant and a team of paid interns. We estimate the cost for this is approximately $550,000 per year. We also have new partnerships with larger global networks GreenFaith and Our Kids’ Climate (a network of 14 climate parents groups), which are vital for helping us develop our work globally.